May 17 to May 25.... here are pictures from Gabriella's transplant process (no, no surgery pics included)! Click on the album below to view them all! Love, love, love ALL the pictures! I'm sure that Gabriella will treasure them! What an amazing and inspiring journey. Your daughter looks strong and radiant. My 3 month old son underwent open heart surgery at 11 days old for a congenital heart defect so I have tremendous respect for what these amazing heart surgeons and nurses can do as well as the strength and resilience of children. I will continue to pray for Gabriella and your family and follow her story. Thank you for sharing your amazing journey with us!! Just an amazing, beautiful little girl you have!! Had a hard time keeping the tears in while I watched your pictures flash on the screen. I have no idea how you have been so strong. Our prayers are with you still! I've prayed for Gabriella for months, but have never posted. Your pictures bring tears to my eyes... how Great is our God that has held her hand through this amazing journey!! 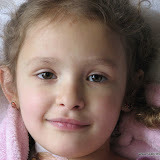 Wonderful, telling photos of a beautiful little girl during her amazing, miraculous journey. Hugs, prayers and peace to all of you. She is an Angel! She looks amazing! I am SO SO SO happy to hear it all went well and that she is recovering perfectly! God bless her and keep her strong and healthy for a very long time now! Her turn to have fun and play and be a little girl ! You are strong parents to go through all you have done with your child. I admire you both greatly. It had to have been the longest, most difficult journey to put a family through! Good luck and may this summer be filled with laughter, sunshine, toys, and lots of love! OMG Kristi and family-those pictures and videos made me cry! Tears of joy and just to imagine what you have all gone through. WAY TO GO!! And Bless the Lord! My kids are sitting here watching with me, and Adi took a liking to her same-age cabroncita :) We love her!! God bless you all!! Princess G looks so wonderful!!! She is amazingly strong....she gets that from her parents! You guys are really amazing. May the Lord continue to give you all strength & good health. We can't wait to see you all & to get the girls together to play. I know it will be a long while, but we look forward for that day to happen. God bless & if there is anything we can do for you, let us know. You're home is on my way home so I can always stop & check in on it if you need me to.